The 1965 Meteor was the fifth most popular selling brand of automobile in the Dominion of Canada. Since 1949, Meteor had been offered by Mercury-Lincoln dealers throughout Canada as a mid-priced model, comfortably positioned between Ford and Mercury. It was highly popular brand, taking nearly 11 percent of sales in its first year on the market. Meteor joined the Ford Canada family for the 1949 selling season. In the late 1950s and early 1960s, more and more Canadians opted for compact cars like the Nash Rambler and the Studebaker Lark. For the 1960 model year, the Big Three got into the small car arena with cars of their own. 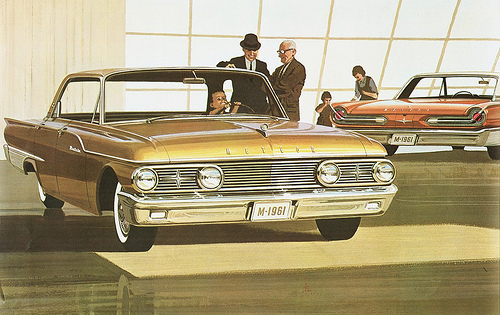 Ford fielded the Falcon and Meteor-Mercury-Lincoln dealers sold the Frontenac derivative. Ford captured 46 percent of all compact sales in Canada in 1960. Unfortunately, many of those sales came at the expense of the larger, more expensive Monarch and Meteor. Both grand names disappeared at the end of the 1961 season. 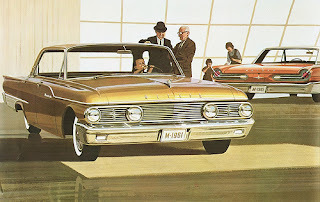 1961 was the last year for the Meteor marque but it would be reintroduced to Canadians in 1964. 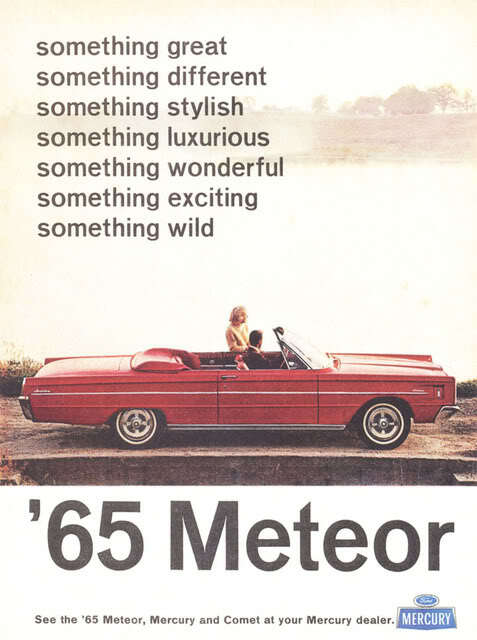 As the compact phenomenon waned, the Meteor nameplate was called out of retirement in 1964. 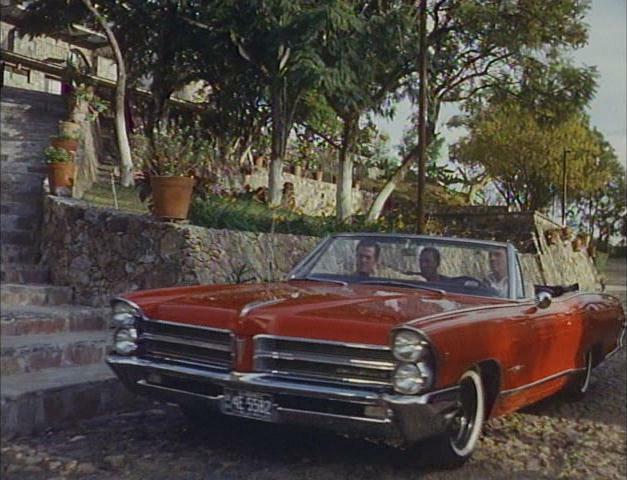 But this time the automobile was based on a Mercury shell, not a Ford body as had been the tradition since 1949. The entire price range was lowered, too. 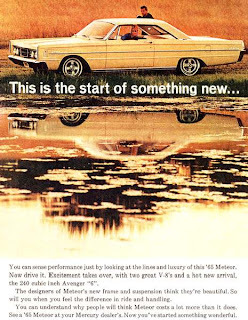 The reasons for the changes were simple: Meteor was being repositioned to take on Pontiac. 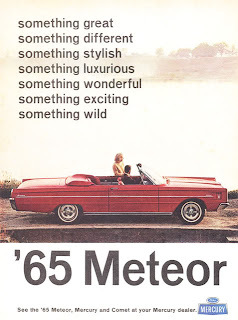 Since its reincarnation was a last minute decision; the 1964 Meteor differed from Mercury only in minor details. Aside from the Meteor badging, it carried a Ford instrument panel and was not as well trimmed as a Merc. Bigger changes came in 1965. Meteors were given distinctive front and rear designs as well as special side trim. 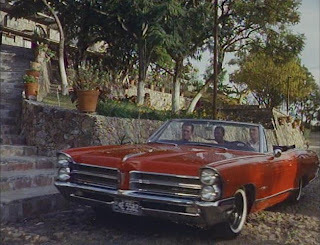 Ford-style roofs were grafted onto the Mercury bodies. 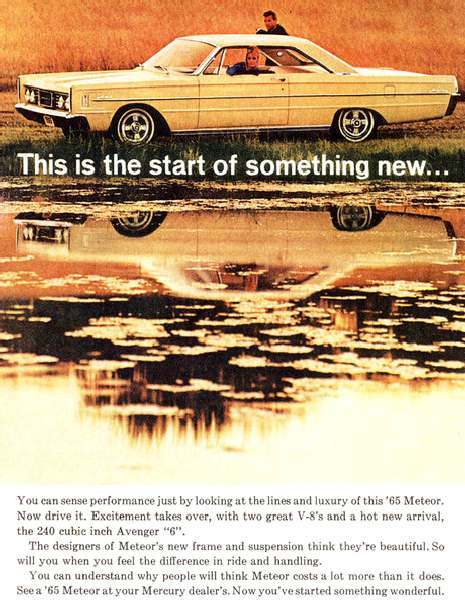 Following Rambler’s trend-setting lead in 1963, Meteor was given curved side glass for ‘65. 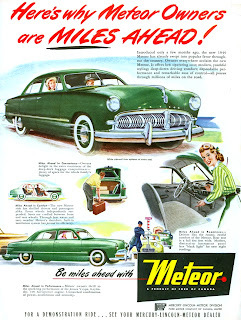 Meteor shared upholstery with Ford and was given the Avenger 240-cubic inch, six-cylinder engine. Advertising slyly referred to the smaller engine as “SIX” appeal. Consumers could choose from three series. Montcalm was the ritzy version with a ragtop and a 9-passenger (ten if one put children in the dual, facing rear seats) station wagon, two and four-door hardtops in addition to two and four-door sedans. 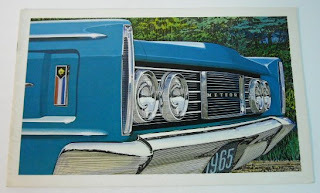 The Rideau 500 series consisted of a pair of modestly appointed sedans. 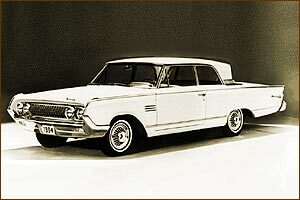 The base Rideau line also had inexpensive two- and four-door sedans and added a stripper station wagon. 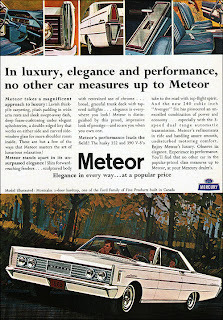 The least expensive Meteor started at $2,850 and 2,189 of the two-door sedans were built. Montcalms offered plush interiors with a wood-grained instrument panel, rich carpeting and leather-grained vinyl upholstery. Bucket seats could be had with a centre console. Rideau 500 cabins were finished in a combination of vinyl with a “Frost Stripe” pattern in a nylon fabric. The basic Rideau was upholstered in vinyl and a plaid stripe fabric. A total of 1,615 Meteor Montcalm four-door hardtops were produced in Windsor for the 1965 model year. All Meteors left the factory with dual sun visors, a cigarette lighter, padded arm rests, a cigarette lighter, a heater and defroster, electric windshield wipers and “man-sized” ashtrays--fore and aft--as standard equipment. Wagons got special treatment with a “venturi air-flow system’ that drew air in through the roof pillar at the rear of the cargo area window then forced it across the tailgate window to keep it clear of snow and dust while the car was moving. The optional luggage rack was adjustable and came with tie-downs and straps as well as a ski-rack adapter. The cargo area was vast at 91.3 cubic feet and the cabin was upholstered in a rich, leather-grained vinyl. Only 493 Montcalm 9-passenger wagons were built during the model year, making it the most rare of the 1965 Meteors. Buyers could choose from the thrifty 240-cubic inch six, delivering 150 horsepower; the 352 V-8 rated at a respectable 220 horsepower or the mighty 390-cubic inch V-8 with 300 horses. All engines were available with the self-shifting Merc-O-Matic “Multi-Drive” transmission. Three-speed manuals were available with the six and the 352 power plants. A floor mounted, four-speed manual transmission was optional on sedans ordered with the 390 V-8 engine. The options list was worthy of the Canadian Tire Christmas catalgoue: A heavy-duty 55 amp alternator, heavy duty battery, heavy duty clutch, heavy duty floor mats, heavy duty seats, heavy duty vinyl trim and heavy duty brakes just for starters. Then there were the more obvious niceties including, bucket seats with a centre console, an electric clock, tinted glass for the windshield, a luggage rack, outside rearview mirrors, power brakes, power steering, power windows—including the tailgate, six-way power seats (bench) or four-way power seats (bucket) and a Swing Away steering wheel. A courtesy light group, luggage rack, a limited slip differential, four-speed manual transmission, automatic transmission, seat belts, padding for the instrument panel, a push-button radio (AM or AM/FM), wheel covers, two-speed electric windshield wipers with washers, block heater, rocker panel moulding and vinyl roof all added to the price tag. Meteors could even be ordered with a Taxi Package. GM's Pontiac Parisienne was Meteor's arch-rival in the Canadian market. 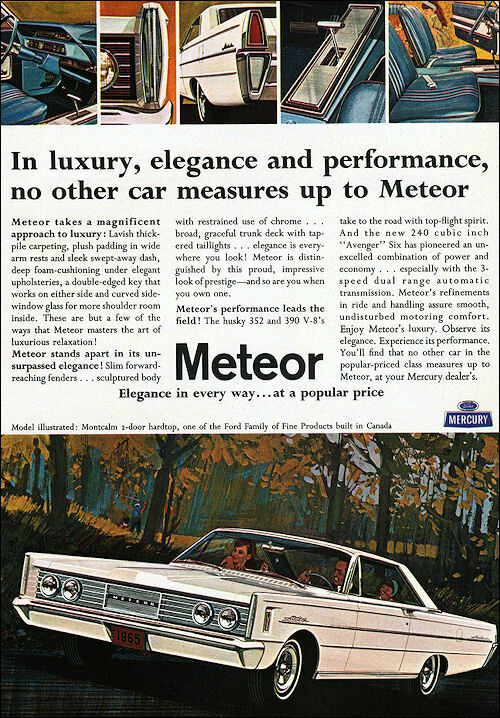 The boys in marketing had hit the nail on the head with the larger, more lavish Meteor. Sales soared to 33,628 units for the year, giving Meteor a very respectable fifth place finish in the industry behind Chevrolet, Pontiac, Ford and Dodge.